New Zealand’s Prime Minister is applauding the news that James Cameron will film not one, not two, but three sequels to his hit movie Avatar in this country. 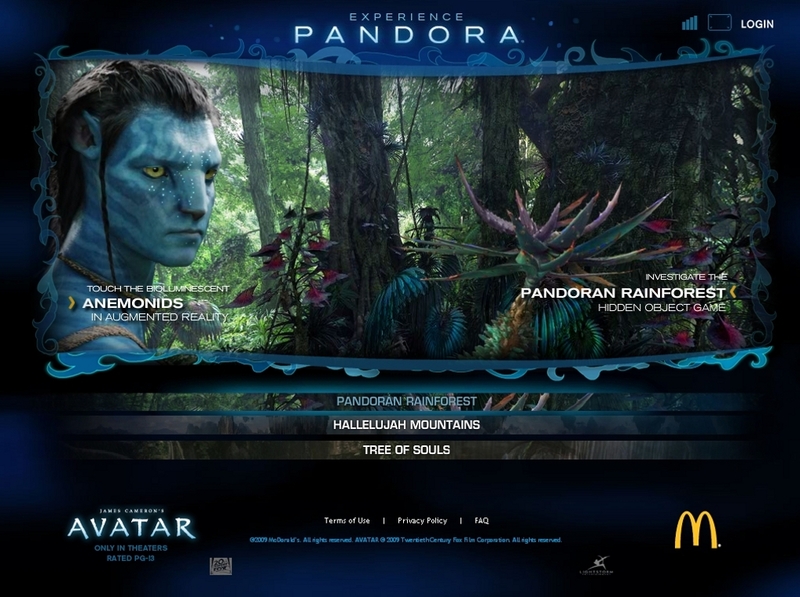 According to John Key, the deal with Cameron means that Pandora, the world of skyscraping trees and floating mountains which provides the setting for Avatar, will become associated closely with the landscapes of New Zealand. Avatarians wearing blue face paint will join pointy-eared Tolkien geeks in queues at New Zealand’s airports and gift shops. But New Zealand is not the only place laying claim to the strange landscape of Pandora. Some of the people of ‘Eua, a Manhattan-sized island in the far south of the kingdom of Tonga, believe that James Cameron developed the setting for Avatar after visiting their forested highland. ‘Eua is made of limestone, a substance that has always appealed to artistic imaginations. In his poem ‘In Praise of Limestone’, WH Auden celebrated the way that the soft, porous rock encourages ‘secret systems of caves and conduits’ and springs that ‘spurt everywhere with a chuckle’. Like the Derbyshire downs that Auden loved, ‘Eua’s highland is distinguished by gaping caves, apparently bottomless sinkholes, and streams that disappear and reappear mischievously. 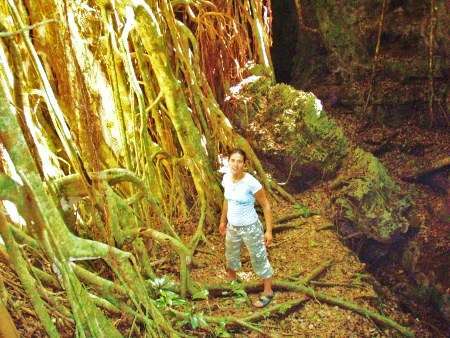 The relatively few tourists who visit ‘Eua are often directed to the highland, and to the giant banyan trees that emerge from the region’s caves and sinkholes. Rearing out of the uncertain earth, in the dank shade of their own uplifted branches, which bulge and knot like strained muscles, the banyans can be an exotic and discomforting spectacle for visitors accustomed to the flat, firm, meticulously cultivated landscape of Tongatapu, the island where three-quarters of Tongans live. The bats that flutter out of the earth and perch by the dozen on the lower branches of the banyans only add to the trees’ eeriness. During the seven visits I have made to ‘Eua since 2010 I have repeatedly heard suggestions that James Cameron journeyed to the island, toured its highland, and took away with him the setting for the world’s most popular movie. Some ‘Euans see a similarity between the Hometree, which rises a mile or so above the surface of Pandora, and their banyans. They also note that in Cameron’s movie the goddess of life, who is identified with the forests of Pandora, is known as Eywa. Cameron famously employed a team of linguists to create the language spoken by the indigenes of Pandora, but every invented tongue must have some real-life inspiration, and his employees have admitted borrowing certain words from Polynesian languages. The ‘Euans I have talked with maintain that the name Eywa is meant as a coded acknowledgement of Cameron’s debt to their island. And yet the ‘Euan claims to ownership of Avatar only go so far. The islanders I have talked with about the film have proudly claimed the landscape of Pandora as their own, but have resisted identifying themselves with its indigenous heroes, the slender, blue-skinned, half-naked Na’vi. With its portrayal of a clash between the simple, sensuous Na’vi and a gang of avaricious, technophiliac human miners, Avatar is a retelling of a very old European fable. Since the eighteenth century, when Rousseau and his disciples hailed the inhabitants of newly ‘discovered’ societies like Tahiti and America as ‘noble savages’ with lifestyles and values inimical to the grubby commercial world of Europe, Western intellectuals and artists have been idealising and patronising indigenous peoples. The myth of the noble savage reached its intellectual apogee in the 1940s, when Alan Moorehead published The Fatal Impact, a book that argued for the complete incompatibility of indigenous culture and modernity. Surveying the recent history of the indigenous peoples of the Pacific, Moorehead could see only cultural corruption, and could predict only assimilation and extinction. Moorehead’s perspective has been discredited amongst most scholars of Pacific history and culture, who point out that Tahitian or New Guinean culture is no less compatible with modern technology and economic development than German or Chinese culture, but his ideas have a lingering influence amongst well-meaning members of the First World left. When Avatar appeared in 2009, a number of leftist commentators tried to see it as an allegory for the situation of indigenous peoples in the Pacific. The Kiwi activist Omar Hamed, for example, decided that Cameron’s movie celebrated the guerrillas armed with homemade, one-shot rifles and unexploded World War Two bombs who defeated Western-trained Papua New Guinea troops and shut down a huge copper and gold mine on Bougainville in the 1990s. But where James Cameron’s noble savages see the very act of digging up the earth in search of precious metals as an act of unforgivable sacrilege, and want only to be left alone to live as hunter gatherers in the forests of Pandora, the members of the Bougainville Revolutionary Army were upset that they had not received reasonable royalties and decent jobs from the multinational company mining their island. They wanted to exert control of the mine, not close it down. Many of the BRA’s fighters were recruited from a cargo cult whose leaders had for decades been promising Bougainvilleans an avalanche of Western goods and cash. It was a craving for technology and wealth, not an aversion to these things, that motivated the Bougainvillean rebels. Like the Bougainvilleans, Tongans have little enthusiasm for the lifestyle and values of the noble savage. The same ‘Euans who lay claim to the landscape of Avatar talk excitedly about the booming market for the tobacco grown on their island. They enthuse about tonnes of tobacco being loaded onto the ferry that connects ‘Eua and Tongatapu, about new land being planted with the crop, and about the much-needed cash the plant is bringing into villages. For them, Avatar seems primarily to be a celebration of the natural beauty of ‘Eua, rather than any sort of treatise about the dangers of economic development or the charms of the noble savage. The selective appropriation of Avatar by ‘Euans would probably not surprise Sarina Pearson, who has studied the habits and attitudes of Tongan movie and television audiences. In her essay 'Video Night in Nuku’alofa', Pearson describes how audiences in Tonga’s capital are inclined to reinterpret foreign-made entertainments to suit their own values and purposes. In Nuku’alofa’s living rooms Sylvester Stallone’s Rambo movies become celebrations of Tongan military prowess, as John Rambobo is made into a mere adjunct to Tongan soldiers fighting the Japanese during World War Two. Like Rambo, Avatar is a movie that has been localised. James Cameron’s interstellar drama has become a homage to the beauty of a small Tongan island. I started watching Avatar but I didn't like the strange blue people in it. My son has it and likes it a lot so I might watch it. I didn't know he was the director. I didn't even know who he was! I'm not sure you are right about Rousseau and Moorhead [I know you have talked about this before] I think in many ways it is a pity that they want to produce tobacco when we need to get rid of it. Both my parents died [lung cancer, stroke] from the effects of smoking for years. A case can be also made for ridding the world of illegal drugs and alcohol (legal only if needed for pain or nerve relief etc in special cases) the terrible effects of drugs such as alcohol were not so terrible in most countries outside Europe until these places were colonized and indeed 'Fatal Impact' has a sound ring to it. It was a terrible effect. The destruction of forests by fire in Indonesia is quite a terrible tragedy and is not for the benefit of the people anywhere in the world. A few indigenous workers will get a pittance but in the long run these industries are destroying the peoples' environments. Maori prior to the European invasion or incursion were relatively fit and certainly their culture had no room for drugs or alcohol. Or large scale industries. It is dubious anyone has benefited from this incursion or corruption. Industrialisation has its place but it would be good if some places might resist. The diet of Polynesians influenced by Europeans is atrocious compared to what they consumed prior to the impact of European civilisation and its accompanying and rather dubious culture. Added to that is the cancer of Christianity and other mumbo jumbo religions that have taken away the inherent culture of people throughtout the world who had their own gods etc as we had Wotan etc before, as Nietzsche rightly pointed out, we were weakened by Christianity. Super site with an awesome sharing and astounding stories is ur web I believe you respect that you have a gift with words, I have unimaginably regarded UK Assignment Writing Service the experience of an isolated your online diaries for these posts. At any rate, I'll be subscribing to your assistance and I believe you post again soon. such an unfathomably stunning information thank you given to us. Amazing blog with interesting topics to read. Fresh fruits are naturally sweet and pack huge nutritional benefits as well. Give a truly thoughtful present this year, and let them know how unique they really are with our amazing range of Personalised gifts! Astonishing article writing. Bless you in the helpful advice at writing. Not alone should you give decent subject matter, one might also want to end up writing in the best web log stage. At present go here kitchen remodeling weschester county Bless you designed for attractive tips. Very positive photos. Thank you for the article.